Yes, you read that correctly: The First Lady and Secretary of State are presenting an “INTERNATIONAL WOMEN OF COURAGE AWARD” to a person who celebrates the 9/11 terrorist attacks and praises Hitler. Obama’s support for Egyptian President Morsi is repulsive. After encouraging the Muslim Brotherhood take-over of Egypt, embracing Muslim Brotherhood Egyptian President Morsi, and sending $1 billion of American taxpayer dollars as “foreign aid” to the Muslim Brotherhood Egyptian government, it’s readily apparent that Obama has sacrificed both American and Israeli national security. 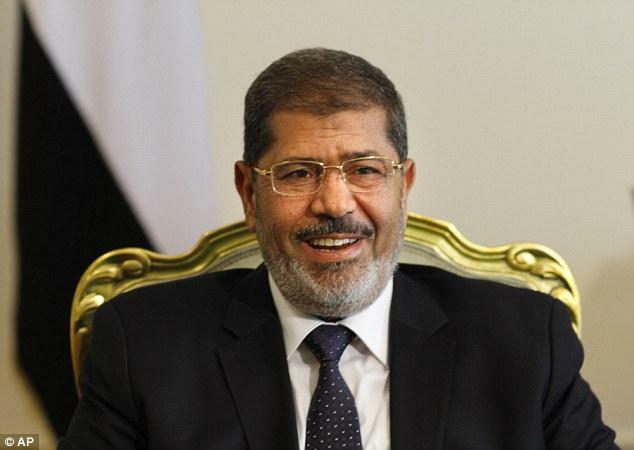 Morsi has been meeting with Iran’s genocidal President Ahmadinejad, has expressed his desire to “destroy the Jews and their supporters,” and now: “Mohammed Morsi described Jews as ‘descendants of apes and pigs’. The Muslim Brotherhood leader is also reported to have asked Egyptians to ‘nurse our children and our grandchildren on hatred’.” Isn’t it amazing that America is going into a downward spiral of debt slavery so that Obama can spend American taxpayer dollars to prop up Morsi’s destructive Egyptian regime? Update: Secretary of State John Kerry has announced that the United States is going to give an additional $250 million of American taxpayer dollars to Morsi’s repressive regime in Egypt. Morsi is Egypt’s “new pharaoh,” and Obama is his #1 fan from the West. The “Arab Spring” soon revealed itself to be the “Arab Winter” under Obama’s failed foreign policy. As we recall: Obama openly supported Morsi by encouraging the Muslim Brotherhood take-over of Egypt, and then invited the virulently anti-Semitic Morsi (the Muslim Brotherhood’s new leader of Egypt) to meet with him. Now, Morsi has seized “absolute power” in Egypt and is being dubbed the “new pharaoh” by rioters. But Egyptians aren’t the only ones who now live in a more dangerous world: some believe that Egypt has become “the new Iran” constituting a huge threat to both U.S. and Israeli national security.